Several years ago, I ditched my crisper drawers. I was tired of the soggy and rotten vegetables that tend to multiply when stored in those drawers. The ultra-organized side of my brain could not handle the waste and chaos created by shoving bags of produce in there and then hoping I would remember to use it all before it spoiled. I set up a system of boxes that works amazingly well for helping produce last longer and actually get eaten in the process! I’ve used this system in a very large refrigerator and in the much smaller one that I have right now. It is completely adaptable; simply find boxes that fit well in your space. In case you missed it last week, I use this DIY Fruit and Vegetable Wash for cleaning my fruits and vegetables. Click here for a printable post without photos. READY TO EAT VEGETABLES: carrots, cucumbers, broccoli, bell peppers, snap peas. 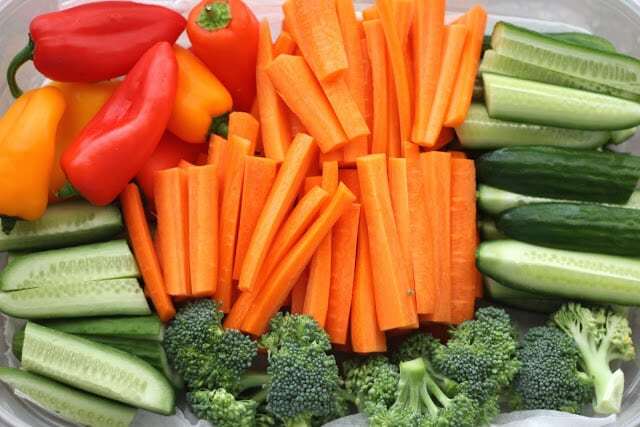 The selection changes throughout the year, but there is always an assortment of washed and cleaned vegetables ready for snacking or salad making. 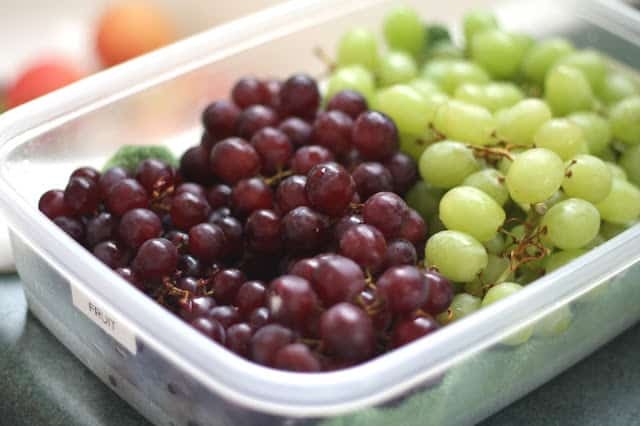 READY TO EAT FRUITS: grapes, berries, melons and pineapple. This selection changes according to the season, but there is almost always something in the fruit box. FRESH HERBS: rosemary, thyme, oregano, basil, parsley and cilantro are the most common. The selection changes according to my mood and whether or not I have fresh herbs available in the garden. There is always parsley in my refrigerator. I keep my green onions and my fresh ginger in this container as well. Everything in this box is wrapped in paper towels. The fresh herbs are wrapped in towels and then stored in ziploc bags with most of the air pressed out of them. My herbs last at least 2-3 weeks this way. I’ve had them last as long as 5-6 weeks. the air pressed out. Lettuces will always last longer if you wait to wash them until you are ready to use them. Keep a layer of paper towels or a washcloth in the bottom of each produce box. The towels absorb moisture, helping everything to last longer. When the towels are wet, simply replace them with dry ones. If a box tends to be more humid and gathers water along the sides or the lid, laying a second towel on top of the produce will help prevent that. 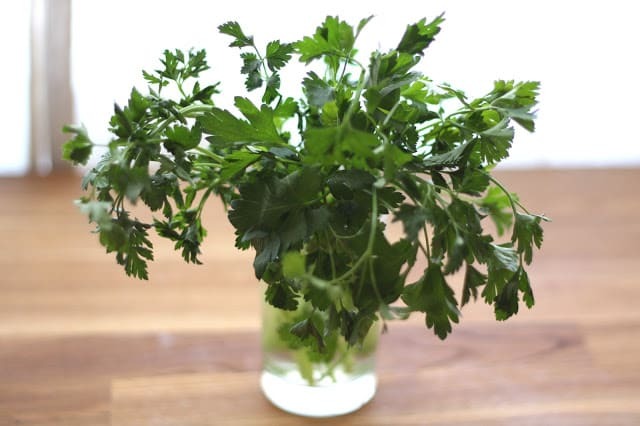 FRESH HERBS can also be kept in water in the refrigerator. It is lovely to see a bright green bunch of leaves when you open the refrigerator. However, I never manage to have enough dedicated space for that, so I tend to use a produce box for my herbs most of the time. 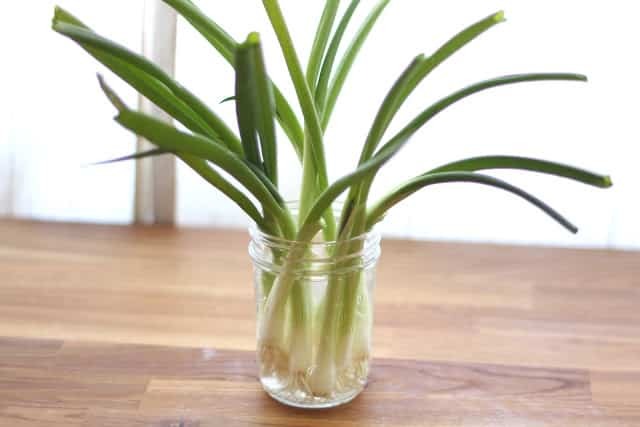 Did you know that GREEN ONIONS can be re-grown in a glass of water? I’ve been doing this for over a year now. As you trim what you need, the onions will grow back slightly lighter in color and the flavor will not be as strong. I tend to trim them down a few times and then use the ends and replace them with fresh onions. CELERY will keep for 4-5 weeks when wrapped in foil. I do not use a great deal of celery in my cooking, but I always seem to need a stalk or two as soon as I don’t have it in the house. 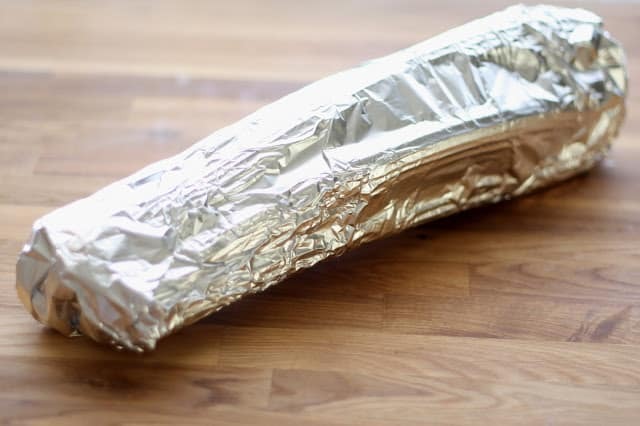 By wrapping the celery in foil, it lasts much longer in between uses. I wrap it in foil without washing it and then just break off and wash the stalks as I need them. You can also wash and trim celery and then store it in the vegetable box with the other ready to eat produce. Mine lasts a couple of weeks when stored in the boxes. 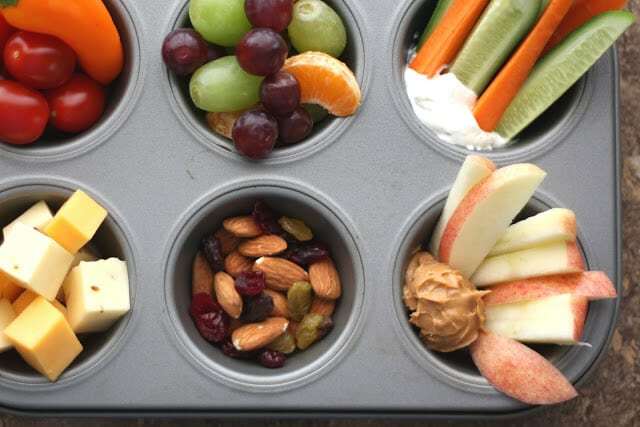 I use the pre-washed and cut vegetables to make our Snack Tray Lunches at least twice a week. I set the vegetable box and some Homemade Ranch Dip on the table almost every night while I am making dinner. We all snack on it as we wait for dinner. I hope this helps you as much as it has helped me. Enjoy! Proud to see I already do a lot of these and glad to learn some new things. Pinning it!! Thanks!! I've been doing the plastic box thing, but use vacuum sealing ones. They keep fruit and veg fresher, longer, but they are so expensive I don't have as many as I'd like. The sealing machine lives in on overhead cupboard so it is convenient to just snake down the hose that plugs into the top of the box. Before I moved the machine to make it convenient I didn't tend to re vacuum after removing food from the box. As a one person household, the vacuum boxes allow me to keep food long enough to get through it before it deteriorates. Now that's an innovative idea for using lunch boxes! I would have never thought it would be more efficient really - back home in Sydney I try to buy fresh produce as close to the day I’m going to use them rather than keep them at home. Wonderful idea. I'm going to do it. You are very creative. I like the general direction but I am very concerned about the plastic containers. Even if they are food-grade (as in food safe) and even if they are BPA free they are still plastic and it is just bad. I would like at least to use glass containers with plastic leads if I must. Also paper towels is good idea but most of the standard ones on the market contain a lotion. Yes, hand lotion is built in them aside from multitude of bleaches and other chemicals that makes me reconisder wrapping food or having them in contact with food for a long time. Perhaps organic cotton cloth that would be washable would work just as well? Half the time I throw a clean washcloth or thin dish towel in the bottom of the boxes, just because I don't have paper towels on hand. 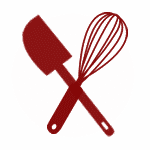 The beauty of this kind of kitchen tip (and most recipes) is that they are adaptable for anyone. Feel free to use this very loose "system" however works best for your way of life. I have just stumbled across your site and LOVE it! 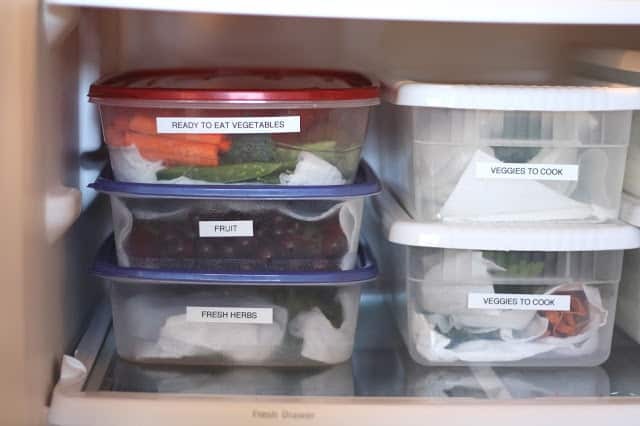 I want to start prepping my veggies like this, but I have a couple questions... 1) how often do you find yourself prepping/refilling the boxes, and 2) do the different types of veggies “get along” well in the same container, like hard crunchy carrots mixed in with soft, mushy-prone cucumbers? Loved this!! Want more tips!! Thank you thank you thank you you thank you!! I bought my fridge used and the crispers were useless. My daughter and I LOVE veggies but they never last! I'm so happy I can across your site. I just came from the grocery and will be doing this. I'm so happy this was helpful, DeAna!